On Tuesday morning, the Quebec Major Junior Hockey League announced their nominees for the 2011 Golden Puck Awards, and New York Islanders prospect Kirill Kabanov was named one of three finalists for Humanitarian Player of the Year. As a forward for the Lewiston MAINEiacs, Kabanov has gone above and beyond his call of duty in regards to community outreach this season. Since the Moscow, Russia native was acquired by the MAINEiacs earlier this season, he’s been thoroughly involved in the Lewiston community. The 18-year-old has a big personality. He’s outgoing, and can be engaging in all five languages he speaks. Nonetheless, he’s extremely proud to be named as one of the finalists. Patenaude said that Kabanov exemplified everything the Humanitarian award represents. In one example of his outreach in the Lewiston community, Kabanov decided that he wouldn’t just sit on the sidelines while he was healing from an upper body injury. Instead, he decided he wanted to greet fans as they arrived at the arena for that night’s game, shaking hands and signing autographs. Other nominees for the Humanitarian Player of the Year award are Alex Emond, of the Rimouski Oceanic, and Gabriel Lemieux, of the Shawinigan Cataractes. 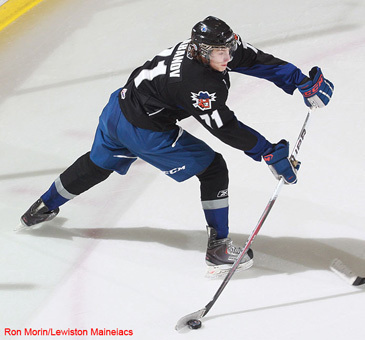 Kabanov is truly happy to be part of the MAINEiacs family. He said he’s not only grown as an athlete, but also as a person.